I've never been to Whitby. Hard to believe that I have lived over 40 years without visiting this fine seaside town. So when we were deciding what to do on Mother's day this year we decided to rectify this (Morticia has never been also and really fancied a day out to the coast) and head north to the town famous for whaling (in the past), Captain Cook, fish & chips and Goths. Arriving we found that lots of others had the same idea. The town was packed and finding a parking space was difficult. We managed to find a car park with a few spaces left. I wasn't sure what to expect, what I found wasn't the traditional seaside resort. Sure there were arcades and bars, ice creams but the feel of the place was distinctly different. The shops obviously took advantage of the gothic, there were some fun and interesting things on offer. Highlight of the day was fish & chips in one of the many fish & chip restaurants. I didn't go with any recommendations so I think we were lucky to pick a good one, Robertson's Fish Restaurant. We had a much needed family day out, it was like a relief from the stressful times behind us and I hope a turning point as we move forward together as a family. As we (or I) drove into the sunset, well sort of, I took a slight detour through Scarborough, a place I knew very well. A place with a lifetime of memories. 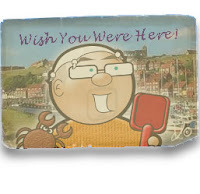 We all said we must visit Whitby again someday. I love going to the seaside but they are all so commercialised now. There are a few jewels left on the British coast, Whitby was great fun as is our favourite Welsh destination.